DUBAI – At a time of civil war, anarchy, extremism, and impoverishment in the Middle East, the city-states of Dubai and Abu Dhabi stand out as the places where Arabic speakers are flourishing, innovating, and offering a model for moving forward. But can it last? I recently visited the United Arab Emirates to seek answers. To begin with, some basic facts: Once called the Trucial States by British imperialists, the UAE consists of seven small monarchies bordering the Persian Gulf. They banded together in 1971, as the British retreated, to form a single federation. The country has been doubly blessed: oil and gas abundance along with a smart and commercially-minded group of leaders. The former gives the country immense resources, the latter keeps it out of harm's way, free of ideological extremism, with a focus on the economy. The result looks and feels like a basically happy place, especially as the lot of immigrant laborers is improving. To me, perhaps the UAE's most noteworthy feature is the entrepôt quality of Dubai, which resembles a Middle Eastern version of Hong Kong. I was also impressed by the innovative religious spirit (where else does one find prayer rooms separated by gender?) and the cultural playfulness (building condos that resemble Yemeni-style high-rises, wearing traditional clothing one day and Western style the next). Demographics: Due to phenomenal growth in immigration, the UAE population has a doubled to nearly 10 million in about nine years, making it much larger than neighboring states such as Oman and Kuwait. Only about one of nine residents are nationals; the other eight are expatriates, with 55 percent coming from South Asia. While currently quiescent, one can imagine their discontent and rebelliousness should the good times end. Economy: Thanks to fracking, the Chinese economic slow-down, and other factors, UAE oil revenue has gone down from US$75 billion to $48 billion since 2010. Even in a country with about a trillion U.S. dollars of reserves, this trend causes pain, especially if it continues for many years. Environmental: Dubai has the amazing statistic of desalinating 98.8 percent of its water even as the UAE has the highest per-capita consumption of water in the world. Obviously, this makes the country extraordinarily susceptible to hydrological crisis. Regional: Nestled about 400 miles from Iraq, 100 miles from Iran, and sharing a border with Saudi Arabia, UAE could be invaded, occupied, and annexed as readily as Kuwait was by Saddam Hussein's Iraq 25 years ago. Not to be forgotten: on the eve of independence in 1971, the shah of Iran seized three UAE islands. Sunni Islamism: Although the authorities have firmly kept domestic extremists under control, they remain in place, biding their time, waiting for an opportunity to lash out. Intensely aware of these dangers, the rulers have adopted two intelligent strategies. One links the country to the outside world via sports events (I was in town during a Formula 1 car race), cultural connections (I attended a talk at New York University's Abu Dhabi campus), tourism (see my selfie atop the world's highest building), and international organizations (the International Renewable Energy Agency, or IRENA, recently opened its doors in Abu Dhabi). In combination, these activities send a signal that the UAE is not just a spoiled, self-indulgent artifice but a place with aspirations to contribute as well as consume, that it deserves support. The second is to master the fine art of compromise. In foreign policy, this means not adopting the Saudis' total anti-Iran focus or the Egyptians' total anti-Muslim Brotherhood focus, but balancing the two. It also means accepting an Israeli mission to IRENA but insisting on it not having a larger significance. In domestic policy, compromise means allowing liquor stores to function but hiding them away under false names and requiring a permit from the police to purchase booze. It also means signs in hotels that permit bikinis but prohibit public displays of affection. 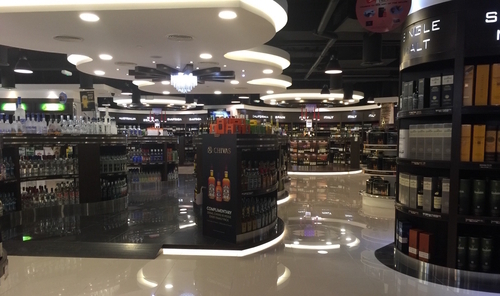 Once you can find it, this Abu Dhabi liquor store, High Spirits, is well stocked. At a time of civil wars in Libya, Yemen, Syria, and Iraq, of Islamist rule in Turkey and Iran, and of looming catastrophe in Egypt, Jordan, and Pakistan, the small, privileged emirates offer a way forward based on globalization and compromise. Will others pay them heed? Will they survive the many dangers ahead? I hope so, for the UAE offers a path ahead to a region badly needing just that. Feb. 8, 2016 update: The UAE prime minister has announced two new ministries: tolerance and happiness. Apr. 11, 2016 update: For a second article on this general topic, see "The UAE's Fragile Good Life."